A revolutionary approach to the treatment of patellofemoral pain. Developed in conjunction with Dr. Christopher Powers at the University of Southern California, the S.E.R.F. Strap™ is the FIRST patellofemoral brace designed to treat patellofemoral pain stemming from abnormal hip motion(s). The S.E.R.F. Strap™ utilizes a unique 3-point hip-leg anchor to treat patellofemoral pain caused by excessive hip internal rotation, adduction, and/or knee valgus. Made of thin Breathe-O-Prene®, the S.E.R.F. Strap™ is lightweight, breathable, and designed to be worn underneath clothing. The S.E.R.F. Strap™ can be used to control abnormal hip motion during leisure/sport activities and as a training tool in the clinic. The DonJoy S.E.R.F. Strap™...Ride the wave of change! Traditional treatment of patellofemoral pain (PFP) has been based on the premise that abnormal patellar tracking and/or malalignment is the primary cause of symptoms. While this theory may hold true in some instances, it is not always the case. In fact, the true etiology of PFP remains somewhat controversial... until now. Research conducted by Dr. Christopher Powers at the University of Southern California has suggested that abnormal patellar tracking may be the result of excessive internal rotation of the femur (i.e. the femur moving under the patella). 1dj Ortho has worked with Dr. Powers to create a brace that treats the patient's condition at the source...the hip. The S.E.R.F. Strap™ stabilizes the patellofemoral joint and reduces pain through external rotation of the femur. The S.E.R.F Strap™ is the first patellofemoral brace designed to treat PFP stemming from abnormal hip motion(s). If you suspect that your patient's PFP is related to poor proximal control, the S.E.R.F Strap™ is the right choice. The S.E.R.F. Strap™ can be used to control abnormal hip motion during leisure/sport activities and can be used as a training tool in the clinic. See height-weight index chart below for sizing. I have hypermobility in most of my joints. My hips are unstable and as a result, cause pain in my knees. Would the serf help? Are you able to wear two at the same time? The SERF Strap pulls the hip into outward rotation which brings the knee into normal alignment. This is for pain around the knee. I would not reccomend wearing two on the same leg. Will the serf help prevent reinjury of mcl? He needs extra support with his knee brace when he does a lot of lateral movement for football. It seems to affect him when he has too much internal hip rotation for lateral movements. Thank you for your question. It would be suggested to get a brace that has hinges to protect the MCL during football. A rigid hinged brace would be best as it will help prevent some of the rotation. I have torn my labrum twice and still have pain in my hip. Would this brace help reduce the pain/ help prevent me from tearing it a third time? Thank you for your question. The S.E.R.F. Starp will help to externally Femur. This brace may help if the rotation problem were originating at the hip. The smallest size we have is for a person who is 4'10" and 90 pounds. Is there a billing HCPC code for this brace yet? If so, what do you recommend? Thank you for your question. The suggested HCPC for the DonJoy S.E.R.F. Strap is L2999. My daughter has a possible labral tear in her hip joint. Would this strap give her relief from pain until she can get further medical care? Can the brace be ordered with straps for both legs? are there any video instructions on how to put on serf strap. I am sorry but there is no video of that. If you call customer care they can email you the instructions for the SERF strap. Hello I'm a runner. I have been dealing with loss of control my left leg. When I get about 10 minutes into run and my leg starts feeling almost loose and all over the place but no pain invoIved. I was wondering SERF strap may help? The S.E.R.F. 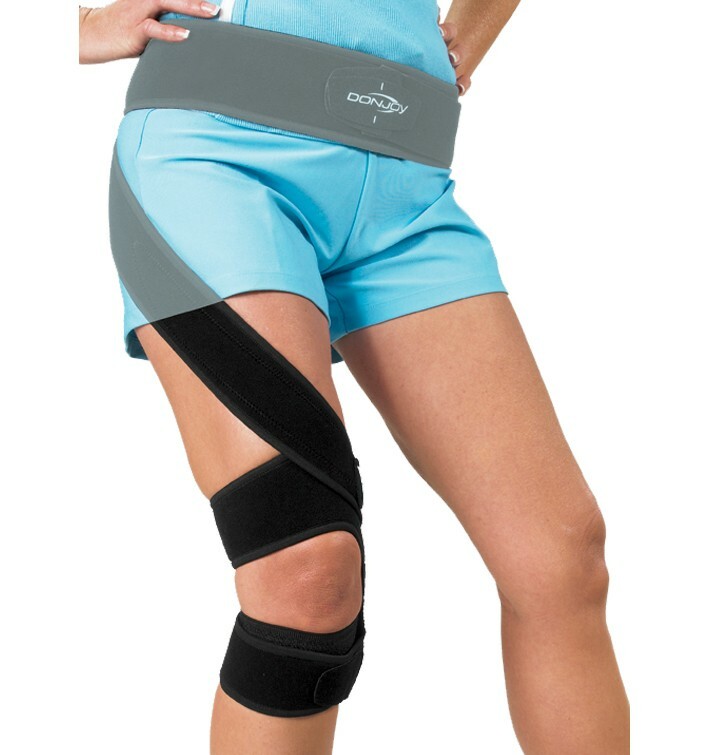 Strap is suited for patients with patellofemoral or anterior knee pain resulting from excessive hip internal rotation, adduction, and/or knee valgus. The S.E.R.F. Strap can be used to control abnormal hip motion during leisure/sport activities and can be used as a training tool in the clinic. Thank You for Contacting Donjoy. I've been diagnosed with patella femoral syndrom in my right knee. I enjoy running and being active, and I have been working on trying to build quadricep strength to improve it, but I still have pain some days. Would this help me to improve my knee stability even more by building the muscles or would it just support my knee and weaken the muscles? I obviously want to strengthen my knee so it can get better. Patella Femoral Syndrome can be caused by many thing in the body including muscle weakness, tightness, and/or biomechanics. Depening on the casue of your injury the S.E.R.F strap could help. It basically acks as a cue for you gluteal and hip muscles to fire when they are supposed to. It will not weaken the muscles you are trying to strengthen and can be a good tool to help with proper mechanic at your hip and knee while running and doing your strengthening exercises. There are other braces that may help your knee pain. The DonJoy Tru-Pull Lite, for example is beneficial if you knee cap is not tracking as it should. This can also be a result of muscle weakness, which it sounds like you are working on. The buttress and straps help align the knee cap in a proper position and can help with decreasing pain. my daughter need this serf brace. We live in Israel. Do you know how I can find someone that will send this to Israel? Distributor # 1: Siram Ltd. Address 1: 28 Gershon St. If i have dislocated my knee cap and i am in volleyball, i wanted to know if this would be good for my knee. I really need a knee brace but i cant find one. Would this be good? This brace is a great tracking brace, but it is not the best for Dislocation patellas. I would suggest looking at either the Tru-pull Lite, or the Tru-pull Advanced system, either of these will be a better choice for you. I am about 10 weeks after left total knee replacement surgery. My left knee wants to lean to the outside instead of going straight. ( Had my right knee done 3 years ago and it tracks just fine. )..Is this a weak muscle or is there a brace I can wear to help speed this recovery up.. What will make this right ?? More exercise ?? Which muscles ?? you will have to check with your doctor on that to make for sure, but normally that can be the result of a quad muscle weakness. If it is your patella that is tracking off, you can do a brace to help with the patella tracking issues. If it is your entire knee that is leaning to the outside a different brace maybe needed. But again you should check with your doctor on what they recommend. I really really really really really liked this! you can wear it underneath clothes and it really truly works! I used mine because I had a labral tear in my hip and I guess the doctor said it would strengthen a muscle that would make my pain go down. It definitely did! This brace is the reason I can walk with ease now! Best 80 dollars ever spent.